Brooklyn native Lori Bell is a flutist and composer of admirable depth and broad musical sympathies. A resident of San Diego, she has contributed to the development of higher standards of performance while earning acclaim from both peers and critics for her artistry on stage and in recordings. She is a three time Global Music Award recipient recognized for her recordings, compositions, and arrangements. In 2016 Lori paid heartfelt tribute to her family and birthplace on her critically acclaimed album Brooklyn Dreaming, her 10th CD, earning four star ratings from Jazz Journal UK, Jazz Times, the Los Angeles Times and Downbeat, which chose it as “Best Albums of 2016.” Huffington Post also chose Brooklyn Dreaming for their “Best of Jazz 2016”. Bill Milkowski wrote in the March 2016 issue of Downbeat: “Bell flaunts prodigious chops on both C flute and alto flute, though her pen might be mightier than her sword. Her originals all reveal a wide harmonic palette, a sophisticated rhythmic sensibility and a refined sense of dynamics, along with an urge to swing.” Veteran jazz critic Scott Yanow chose it as one of his Top 25 Best jazz CD’s of 2016. It also won a Global Music Award for Outstanding Achievement for compositions and arrangements. Lori has toured in Asia, including Singapore and Hong Kong. She has also performed in high profile ensemble settings at The Kennedy Center in Washington, DC, SOKA Performing Arts Center, The Wadsworth Theatre at UCLA, and most recently, on a project of jazz arrangements and classical compositions for the Los Angeles Philharmonic Music Library. She has performed three times at the Gala for the National Flute Association, most recently in 2016. In addition to her global renown as a performer and recording artist, Lori is a respected force in music education. 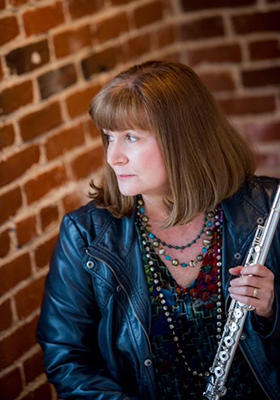 She is currently on the faculty as an Instructor of Flute and studio teacher at San Diego State University and over the years, has privately taught hundreds of students of all ages in both classical flute technique and jazz styling, jazz piano (her secondary instrument), theory, composition and arranging at her studio in San Diego.